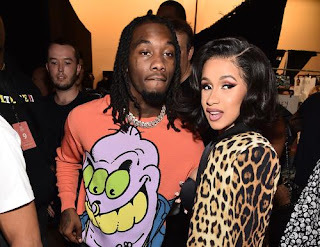 Cardi B and Offset are hard workers. The female rapper just came off her first huge show since giving birth, rocking Global Citizen Festival, and tour dates has been part of the Migos member's schedule for a while now. The couple is clearly in a kind of wind-down mode, roaming the streets in a most laid-back style of dress. Offset was spotted with his boo while wearing a sweatshirt and a mismatched track pant. His lady was looking equally breezy, rolled up in an ample bathrobe. She was also donning pink fuzzy slippers for added cuteness while carrying a Balenciaga bag for an expensive accent. Those bad boys usually go for $1k-3k. Comfort ain't always cheap. Their outfits might be a reflection of their state of mind. Cardi B has just gone through an objectively stressful situation yesterday. She earned two criminal charges after turning herself in, cooperating with the legal authorities. She came out of the police precinct in Queens with a smile on her face, but the star will soon face her day in court. Her arraignment date is booked for October 29. Offset is out on bail for his own legal issues. Some down time is legit, booty boost included.